What does it mean? Something went wrong, perhaps? I am trying to install it on a recent DELL Precision. What window manager or desktop env did you choose and installed ? Did you opt for display-manager or xinit ? I cannot even boot into Archlabs. I’m simply stuck at the screen showed in my previous message, which appears after I am requested to input my name and password. I carefully followed the instructions found in several YouTube videos, and this happens with bot VBox and VMware. 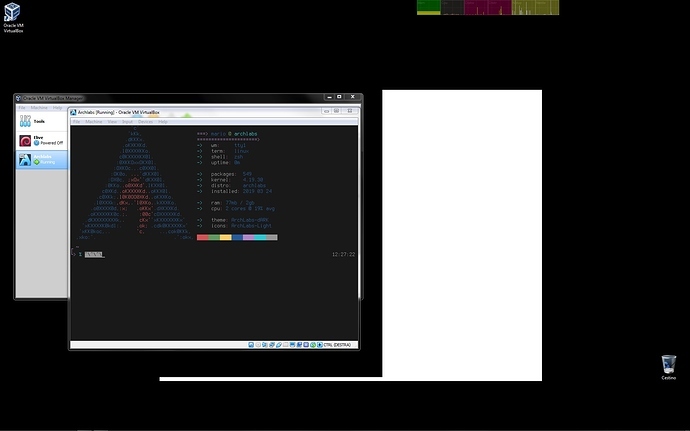 I don’t know if this helps, but the very last character shown in the terminal-like screen above is “%”. That’s how I did for my first archlabs, now for this one I use startx. I cannot even boot into Archlabs. This is clearly not the case, in the image above you have a booted system that appears to be installed, and are mistaking no graphical interface for not booted. I think going for a more beginner friendly distro is honestly a better option for now, don’t take this the wrong way, but you will have issues. Feel free to use it if you really want to, no-one is going to stop you, but you won’t have a good time and “issues” like this will be ongoing. With all that out of the way, get used to using a terminal constantly. I can also confirm it does indeed boot to a graphical session and you likely didn’t pick one during the install. If you tell me which you want (openbox, i3, xfce, plasma, etc…) I can post some commands to run that will install and setup so after reboot you reach a graphical interface. My bad, I apologize with everybody. I thought I had made the various selections correctly, but I didn’t select the desktop actually (I didn’t actually use the spacebar to make selections). Now Archlabs is up and running. I am a Linux beginner as you already understood, but not completely illiterate. In another PC I’ve got Manjaro in dual boot with Windows and it’s working well.